Let us supply you with everything you need for a pottery-painting event at home, at school, or wherever you like! If you'd like to host a pottery-painting session of your own, for friends or family or any group or class that you're involved in, we can help. We can supply pottery on a sale-or-return basis, at a discounted rate; and we can lend you all of the special paints and equipment that you'll need (including guidance notes about pottery-painting). Just pay us a deposit, take the pottery and the kit away with you, then bring it all back after your event and we'll glaze & fire the pottery for you as usual. It's that simple! Just get in touch to tell us about your event, and we'll provide everything you need for your very own pottery-painting party! 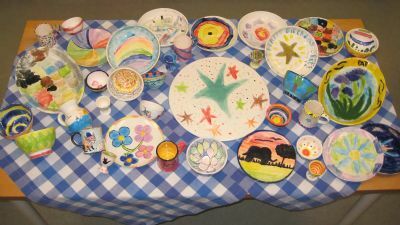 As part of her family's get-together in London to celebrate her 70th birthday, Pat arranged for family members of all ages to paint a range of pottery pieces for her. We supplied the pottery on sale-or-return basis, plus all the kit they needed; and Pat now has a unique, wonderful, & amazing, range of pottery to treasure forever! Wow!